Foxes are members of the family canidae, or dog family, although they aren’t as social as some of their cousins, typically hunting alone. Foxes are small and slender, with fluffy tails and large, pointed ears. 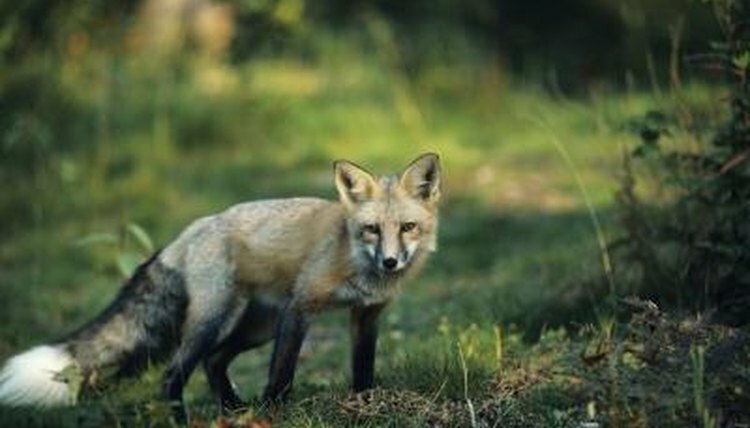 Relatives of the fox include wolves, coyotes, jackals and both wild and domestic dogs. Known for being social and living in large packs, wolves are the largest member of the canidae family. Several species of wolves live in the Americas, Europe and Asia. Gray wolves are the largest wolves, weighing up to 175 pounds. They used to be common throughout North America, but their population has suffered due to hunting. The smaller red wolf lives in the southeastern United States but, like the gray wolf, they've been hunted and their numbers have dwindled to roughly 100 survivors. The South American maned wolf looks like a large red fox with long, thin legs and slender face. Coyotes look kind of like wolves, but smaller. Coyotes are about the size of a medium-sized dog -- around 50 pounds at most. Coyotes live all across the U.S. and most of Canada in tight-knit family groups. Coyotes are adaptable and can live in most environments, from open fields to suburban areas. Coyotes can hit speeds of 40 miles per hour, among one of the fastest land animals on Earth. There are 19 subspecies of coyote, including the Mexican coyote, northern coyote and Texas plains coyote. Jackals look kind of like foxes, only larger. They have thin frames, slender faces, bushy tails and large ears. Jackals are found in southeastern Asia and Africa. Jackals live in small family groups and will hunt together. Species of jackals include the golden or common jackal, the black-backed jackal, the side-stripped jackal and the simian jackal. The main distinction between species is their coloration. The black-backed jackal is the most recognizable, tan in color with a patch of mottled black fur across its back. As part of the canidae family, foxes are relatives to domestic dogs, as well as the several species of wild dogs. African wild dogs live in southern Africa in large packs. African wild dogs have a mottled black, white and tan coat. Dingoes are wild dogs that live in southeast Asia and Australia. Their short coat is ruddy tan and they typically live alone. Many dingoes have bred with domestic dogs, resulting in much of the population being hybrids. The dhole is a wild dog found in large packs in Asia. They have rust-colored coats, with white undersides and a fluffy black tail.